BlizzCon has barely begun, but we already have some information on the much awaited Starcraft 2: Legacy of the Void. This early reveal comes to us courtesy of writer James Blocksom, who posted a photo via Instagram. This picture features a poster of Legacy of the Void’s “Archon Mode”, a multiplayer mode which lets two players control a single base. 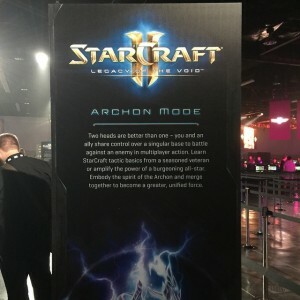 According to inFeZa, who anyone who watches their Starcraft 2 eSports should now, Archon Mode is even playable on the show floor. He is also steadily leaking small little tidbits, all of which I will coalesce into one article once the dust settles. Tagged with blizzard, changes, gaming news, kerrigan, legacy of the void, lotv, modes, multiplayer, new modes, sc 2, starcraft 2, trailer, zeratul.